Shiro is an 11-year-old genius NEET, hikikomori gamer who is a part of 『　』 (Blank or Kuuhaku) player, along with her step-brother, Sora. 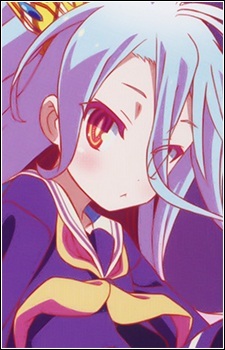 Shiro is described as a genius in logic and problems, but has difficulty understanding emotions or behavior, relying on Sora to help her defeat human opponents such as Tet in their chess match. She also rarely shows much emotion at all on her face and, despite her genius intellect, speaks in short terse sentences. Shiro is extremely close to her brother, to the point of needing him by her side at all times to be comfortable. She is also shown to have a dry and somewhat twisted sense of humor, and displays signs of jealousy if Sora pays serious attention to other girls, showing she has a brother complex.